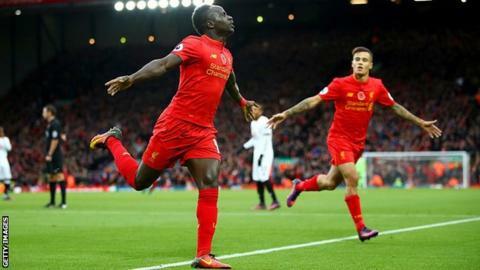 Liverpool have arranged for a private jet to fly striker Sadio Mane back from the Africa Cup of Nations to give him a chance of facing Premier League leaders Chelsea at Anfield on Tuesday. Mane is available again after Senegal lost 5-4 on penalties to Cameroon in the quarter-finals on Saturday. The 24-year-old former Southampton player missed the crucial penalty. Liverpool have won only one game since he left for international duty after a 2-2 draw at Sunderland on 2 January. They were knocked out of the EFL Cup by Mane's former club on Wednesday, then eliminated from the FA Cup by Championship side Wolves on Saturday. The Reds will check on Mane's fitness before making any decision on his involvement in Tuesday's game against Chelsea, who are 10 points ahead of them.